It seems like yesterday that Blackpool were pushing Manchester United as hard as they could on the final day of last season before eventually being relegated, however, all that is in the past and on Friday night Blackpool face Hull in their first game of the new season. Last season finished with an article on the blog that tried to unpick what might be going on at Bloomfield Road over the summer break and to show the extent of the task that Ian Holloway faced. This summer has seen some high profile departures, some surprises and some interesting new recruits. Initially, it appeared that Blackpool would have to bring in around ten players to rebuild their squad and bring in players as replacements for key players. Whilst all this was going on it was speculated that Holloway may be trying to strike a balance of experience and youth throughout the squad. This post will pick up where we left off setting out how the squad looks now and if there may be any more new faces coming down to the sea side. To start things off let’s see where we were when the last post was written. A few assumptions were made about the players that might be a part of the squad and that left Blackpool with a threadbare squad of just fourteen players. When trying to pick a team from those there were some glaring gaps, particularly in goal and left back. It is at this point that the first observation of the summer is to be made. The assumption back in June was that both Stephen Crainey and Matthew Gilks wouldn’t renew their contracts and would move elsewhere. However, the club managed to persuade both of these players to sign new contracts and in doing so ensured that the critical vacancies were filled quickly and with a minimum of fuss. This could well be the best bit of business that the club do all season, it ensures continuity of play, continuity in the changing room and retains their experience. Valuable experience of the Premier League, but both were a part of the side who were promoted the season before last. All of a sudden, as you can see blow, just with those players back on board the projected first eleven started to shape up well. Before delving any deeper at this stage lets just lay down the players who currently form a part of Ian Holloway’s ‘match day’ squad. These are the players that it would be safe to assume would be the first picks, eliminating some of the younger professionals, assuming that they’ll play League Cup games and reserve team games or departing on loan. 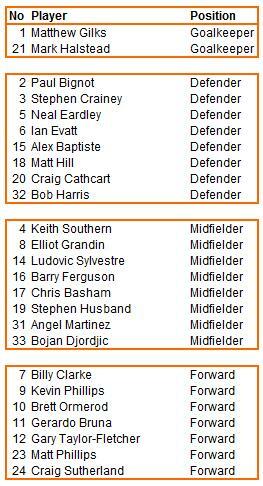 As you can see Blackpool have a squad of 25 players and there are plenty of options across the pitch. When Crainey and Gilks agreed their contracts there were still plenty of vacancies to be filled. A quick look at the currentl squad shows how those vacancies have been filled and the players that Ian Holloway at his disposal appear to cover all his requirements. This point is regardless of player quality and subjective opinion on the matter. This is just about the profile of positions vacant and assumed quotas. The positional analysis of the squad is below with some assumptions around certain players and their first position i.e. Alex Baptiste is counted as a centre back, but may well start at right back or Gerado Bruna is listed as a forward when he could in fact play as a central attacking midfielder. It looks like Holloway has covered all his bases and in fact he may be oversubscribed up front. However, that might change if players start to leave. For example, Stephen Husband has been listed as a midfielder here, but it may be very likely that he goes out on loan as could someone like Craig Sutherland, should he be short of game experience as the season progresses. There’s clearly good postional coverage across the field for Blackpool, giving Holloway plenty of options and flexilibility. In addition to that there are players in there that can cover more than one position. The one area of doubt might be hidden however, as Matt Hill was counted as a centre back and there’s a chance that his acquisition was in anticipation of losing Stephen Crainey. He has been tried at centre back in pre-season as the Bob Harris from Queen of the South appears to be the second choice left back. Should anyone else be signing before now and the transfer window then a centre back might still come in, leaving Matt Hill with some work to cement a place in the first team squad. 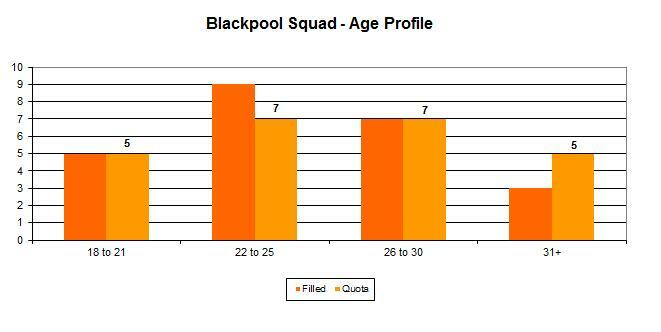 In terms of experience Blackpool were lacking across the board after the exodus at the end of the season, below is a table showing the spread of ages across the squad. It appears that there is a slight imbalance in the 22 to 25 and 31+ groups, however, given that there are a few players around the age of 30 and have a good level of experience behind them then that is something that Holloway might be happy with. However, given the earlier point about a centre back in addition to this then should a centre back be purchased then it would be no surprise if they were around the 32/33 year old mark as well. As you have hopefully seen, Blackpool have a good base to start the season with. The key to further recruitment may well centre around a new centre back as discussed or more than likely further recruitment may be dictated by their performances early in the season or players offered on loan by Premier League clubs. This round up the first post of the new season and was wholly intended to pick up where we left off last season. Before the new season kicks off there will be a post in addition to this reviewing the players that have come in and how Blackpool might line up this season. Note: Since this article was originally written Blackpool have signed Tom Ince and Miguel Llera, a forward and centre back.